The Track Trailer Tvan. It’s one of Australia’s best known offroad rigs. A legend on wheels, some would say. That’s high praise, indeed. But whatever your background, it’s simply not possible to credibly claim that the Tvan hasn’t had a major impact on Australian offroad touring. The first generation Tvan was launched at the turn of the millennium. With its distinctive shape including a rear hatch, drop-down deck and tent, it was a hard floor camper trailer unlike anything seen before. The MC2 Asymmetric Link independent suspension system, originally designed by Track Trailer for the Australian military, seemed a natural fit for the Tvan and quickly won applause from the offroad set. 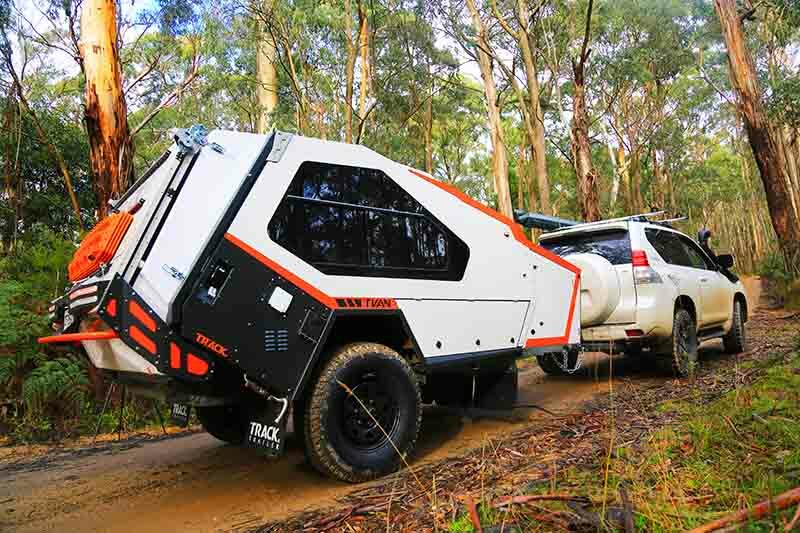 Over the years, there has been three new iterations of the original Tvan, each designed to further fulfil this camper’s commitment to open the bush and outback to more people. And now, Track Trailer has lifted the curtain on a fifth generation Tvan. The question that remains is, does it live up to the promise made by the first Tvan almost two decades ago? Or, a bit like the Nissan Pathfinder when it was relaunched a few years ago, has Tvan gone soft? If you knew anything about Track Trailer, you’d know it’d be a cold day in hell before it’s flagship camper gave up its offroad cred. On its face, the fifth-gen Tvan is a more refined version of its predecessor. All of the ‘niggles’ – the things that made you go ‘hmmm’ when camping with it – seem to have been addressed. With a healthy dose of lateral thinking, I might add. But there has also been an underlying overhaul designed to make the camper more user-friendly than ever. We got our hands on the top-spec Murranji, and quickly noticed the new operation of the rear hatch. Whereas the earlier Tvans required you to first lower the deck to access the hatch, both will lift at the same time. So what? I hear you ask. 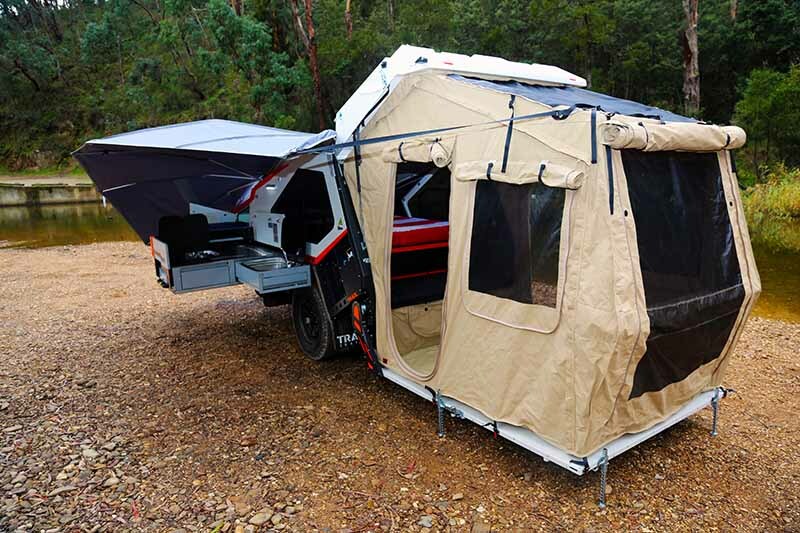 Well, this means the camper is still completely useable for quick stops or overnighters, situations where you mightn’t feel like setting up the deck and tent. It’ll also make packing and unpacking a heck of a lot easier, in my book. “No other camper can claim such quick access,” Lloyd Waldron, Track Trailer’s marketing manager, said. And he’s right. It is, literally, as easy as accessing the boot of a hatchback vehicle. The tent, too, has undergone some interesting changes, namely in the way it attaches to the deck. According to Lloyd, customer feedback demanded an even quicker and easier set-up procedure. So with the Mk5 Tvan, gone are the fiddly catches in favour of magnetic ones on adjustable straps. In fact, all points of attachment are now magnetised, and if that sounds wishy-washy, it’s only because you haven’t seen it. The setup holds the canvas taught as a drum. As I said, lateral thinking. The previous bulkhead at the entrance to the cabin has been removed, too. The old bulkhead contained a stereo but that’s been replaced with a bluetooth Fusion unit that can be removed from its docking station when you’re away from the campsite. The result is a more open, more easily accessible cabin. Speaking of opening up the cabin, the fibreglass roof of the Mk4 has been redesigned to achieve an additional 100mm of head room in the cabin. “It’s made it significantly more comfortable, it’s just a space you want to be in,” Lloyd said. The ‘Quick Cover’ awning is also new. It’ll open up over the nearside kitchen in mere moments, and pack away just as easily. It’s a self-supporting unit designed by Track Trailer, with no vertical poles or horizontal tensioning bars required, although Track Trailer does supply some upright poles in case of wind. The kitchen hasn’t undergone any changes, other than the addition of some new LED lighting above and below – it’s still the ‘Premium’ kitchen first seen on the Mk4. And it’s still a class act. The slide-up wind-deflector is terrific, there’s heaps of storage, and it’s self-supporting. The slide-out for a portable fridge up front hasn’t changed, either. It’s a BYO-fridge situation, but Track Trailer’s thinking is that most of its customers have their own fridge – why saddle them with something they probably don’t need? Track Trailer’s semi-famous Interior Command Console has been upgraded as part of the Mk5 overhaul. In the Tanami model up to the top-end Murranji (as seen here), it now includes a 25A DC-DC charger with MPPT solar regulator, a 120W solar panel on the roof (so the onboard battery is constantly charging), as well as a 21A 240V battery charger and an integrated battery management system. It even has the option of a bluetooth control for the battery management system. The ICC is also instantly compatible with lithium batteries. Having said that, our Tvan Murranji was fitted with two (optional) 90Ah lithium batteries. Inside the Tvan, the Mk5 still has a queen-size bed but I’d agree with Lloyd that the entire setup feels more roomy. It’s amazing what an extra 100mm of head room will do, and the removal of that rear bulkhead certainly makes the tent/deck area and cabin area feel more ‘as one’. There’s still a heap of storage under the bed sensibly organised by three lockable drawers made of sheet metal. Each Tvan model, excluding the base Yulara, has a ‘draw from a creek’ facility that utilises the camper’s onboard pump. This allows you to choose to draw your water from the onboard tank(s) or from another source, such as a running river. Importantly, this system doesn’t fill the onboard tank(s); instead, it directs the water straight to the shower and kitchen outlets. This means that you could, conceivably, leave some of that water at home (but is that ever a good idea?) in order to save on weight. Now, Tvans have always been light – around 1.1 or 1.2 tonnes for the top model. But as fitted to our review Murranji, the Mk5 is available with 1.8-tonne-rated MC2 Asymmetric Link suspension and an ATM rating to match. The thinking is pretty simple: to allow owners to legally load more gear, water and stores. A note about weights: the Murranji in base spec weighs in at 1100kg Tare, with a ball weight of 130-140kg; however, the options seen here have added 137kg to the Tare and about 20kg to the ball weight. We’ve barely scratched the surface of this next generation Tvan. There are plenty of other features we could talk about, from diesel hot water and space heating through to the three-speed fans, the optional drawbar storage system, rear insect screen for the tent, the breakfast bar that clips to the tent’s vertical poles… but these are all features that were also found on the Mk4. Instead, I have focused on the changes. The Mk5 has been in development for more than two years or, if my sums are correct, immediately since the launch of the Mk4. And, no question, it looks every inch a Tvan, with the same offroad swagger and bulletproof appeal. The lift-up deck (as opposed to the earlier version which had to be dropped down before accessing the cabin) makes complete and utter sense. So much so that one has to wonder why it wasn’t done earlier. Oh well – good things come to those who wait, and all that. In any event, Track Trailer remains confident in its go-anywhere ability, stamping the new Tvan with a five-year chassis and suspension warranty, and a three-year body and build warranty. With the Mk5 Tvan, Track Trailer has, in essence, made a very good thing even better.